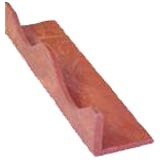 Designed to provide proper cant and provide a finished appearance at the eave line. Used at the ridge to close off the top of the tile and provide a finished appearance. Designed to be the first piece of trim to start hips and ridges, the bull nose/hip starter provides a professional finished look. This smaller radius trim is generally used on hips, but may be used on ridges if desired. This larger radius trim is used on ridges. 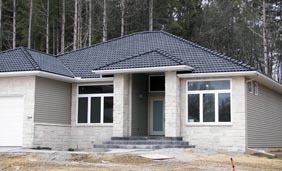 The wider design is suitable for continuous ridge vent installation and will provide a bolder look at the ridge. Rake trim is the finishing touch used along the gables. The pieces are universal and will fit right and left sides.